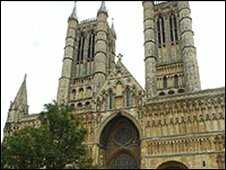 Lincoln Cathedral is a "powerhouse" that drives the regional economy and supports hundreds of jobs, according to a new study. It supports more than 600 jobs by attracting visitors to the city, the consultant's report carried out for the dean of the cathedral revealed. The Magna Carta, located at the Lincoln Castle and owned by the cathedral, also draws many visitors. It had a total of 200,000 visitors in 2007, the report said. The cathedral has also been the location for two major films since 2005 - the Da Vinci Code and Young Victoria. The cathedral was responsible for supporting a total of 649 jobs, according to the study, both through direct employment and the spin-off from the income created by the tourists it attracts to the area. A spokesman for consultant Globe Regeneration said: "The Cathedral is a powerhouse and promoter of the tourism industry, a leader in traditional craft skills and as a major publicist for the area." The Dean of Lincoln The Very Reverend Philip Buckler said it demonstrates just how much the cathedral contributes to the community and the economy. The report looked at the postcodes of 1,100 visitors and found that 78.9% came from outside the East Midlands region - with 7.6% of them from overseas. The overseas visitors were mainly from Canada, Australia and Iceland followed by USA, New Zealand and Spain. There has been a decrease of about 5% in visitors in the past year, church officials said.